Black G10 Handle Folding Shaving Straight Razor & Leather Strop - One of the most popular, nostalgic tools of all time. The straight razor has been around for centuries and continues to be a worldwide favorite. The Pride Cutlery line of straight razors offer beautiful custom handles with silver etched bolsters. The 4.5" blade with 3" face features the Pride Cutlery name and logo and is composed of German surgical steel that will shave the hair off your arm right out of the box. 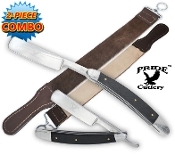 A few swipes on the included 18" genuine leather strop, and you're ready to shave faces and sensitive areas. Quality craftsmanship ensures that this razor will be giving smooth shaves for years to come.